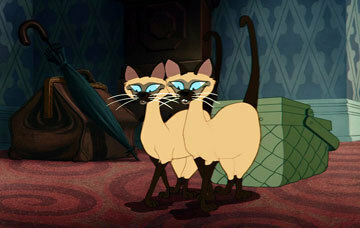 Si and Am. . Wallpaper and background images in the cattivi Disney club tagged: disney villain villains si am si and am siamese cats cat lady and the tramp lady & tramp. This cattivi Disney photo might contain soggiorno, salotto, camera anteriore, salone, sala, salotto, salotto, sala ritiro, and camera di ritiro.